Cristina Alciati is a successful Essex-based Personal Trainer and creator of the SMART Fitness Makeover specializing in body sculpting without drudgery and weight loss without silly diets. She has competed in artistic gymnastics and modern dance, was a keen pole fitness instructor for a number of years and is a lover of motorsports. After studying several styles of martial arts for over 30 years with the best instructors in the world, she gave up guns, sticks, knives and gi’s to focus her energies on more girly pursuits. She took up pole dancing, calisthenics and yoga with a view to having a go at Free Running before her 50th birthday. Cristina’s first experience with Thai Massage was in 2005 during a month long stay in Hong Kong to study Wing Chun Kung Fu with Grandmaster Ip Chun. She would cross over to Shenzhen in mainland China to visit the Thai massage parlour. After only a handful of treatments, her physical condition improved significantly with years of accumulated muscular tension and joint stiffness gone. She was able to practice martial arts with increased power and agility. 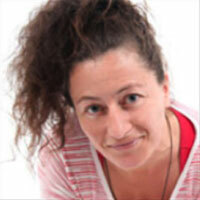 Impressed, Cristina joined the London Institute of Thai Yoga Massage owned and run by Natasha de Grunwald who herself learned in Chiang Mai, Thailand, from one of the most prominent teachers of our times, Asokananda. Cristina enjoys providing Personal Training to clients and sharing the wonderful spiritual experience that is a full Traditional Thai Yoga Massage treatment.